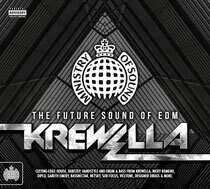 Krewella kick off the first in a brand new compilation series from Ministry of Sound. After bursting onto the scene in 2011, the Chicago-bred trio was recognized for their signature brand of vocally driven electronic music. Comprised of singer-songwriter sisters Jahan and Yasmine Yousaf backed by producer, Kris “Rainman” Trindl, since their debut with platinum-certified single, ‘Alive’ they have gone on to play at some of the best festivals and clubs around the world. Their musical ethos has also led to various collaborations and remixes with artists such as Nicky Romero, Headhunterz, and Gareth Emery. Now they take the helm of the inaugural transmission in ‘The Future Sound Of EDM’ series on Ministry of Sound. The ‘Future Sound Of EDM’ compilation format itself is one that looks to provide emerging artists with a platform to tread their own individual paths through a bustling EDM scene. Due for release on 22 June, Krewella’s compilation piece spans over two CDs, exploring a fully comprehensive mix of styles and sounds, featuring everything from vibrant, colourful house to murky electro and D&B - plus some dubstep and hardstyle. It includes tracks and remixes from the likes of Nicky Romero, Gareth Emery, Diplo, Bassnectar, Netsky, Sub Focus, Vicetone, Designer Drugs, Mat Zo, Loadstar and Krewella themselves. Krewella make their debut appearance at The Gallery at Ministry of Sound next Friday 13 June to celebrate the launch of the new compilation. The Chicago 3-piece arrive at The Gallery riding a wave of success, including playing the main stage at Miami’s Ultra Music Festival and appearing on the USA’s Good Morning America TV Show (the first EDM act to play a US breakfast TV show). Hiya very cool web site!! Guy .. Beautiful .. Amazing .. I'll bookmark your website and take the feeds also? I am satisfied to seek out numerous helpful information right here within the publish, we'd like work out extra strategies on this regard, thanks for sharing. . . . . .